Pankaj Pandy (29) from Kings Court, Mungret Street, Limerick, pictured at the Dublin District Court today Pic Collins Courts. AN INDIAN businessman and his pretend bride from Latvia have been spared jail over a “sham marriage” which allowed him remain in Ireland and set up a successful chain of sandwich bars. Pankaj Pandey, 29, with an address at Kings Court, Mungret Street, Limerick and his wife through a “marriage of convenience”, Dace Beikmane, 29, who now lives at Gleneagles Avenue, Leicester, in England were given suspended sentences on Tuesday. They were arrested by detectives as part of Operation Vantage – a crackdown on immigration offences and marriages of convenience. Judge Bernadette Owens heard at Dublin District Court that Pandey runs five Subway sandwich bars and one Four Star Pizza branch and now employed 30 people. He came to Ireland on a student visa in 2006 but after completing his studies wanted to remain here and after paying a “facilitator” about €7,000 he married Beikmane in 2012. She had come here looking for work and was easily led, the court was told. He was then able to get a visa allowing him residency in the State having married an EU citizen. Within months she left and has been living in England with her fiancee since 2013. The couple were arrested on Monday by detectives from the Garda National Immigration Bureau Naturalisation & Immigration Service Registration at Burgh Quay, in Dublin city-centre. She had returned this week to present to the authorities with Pandey to let on they were still married. They pleaded guilty to charges under the Civil Registration Act. In an outline of the prosecution evidence Judge Owens was told “a marriage of convenience” was defined under the Act as being for immigration advantage for a non-national. Dublin District Court heard Pandey was from India and Beikmane was Latvian. 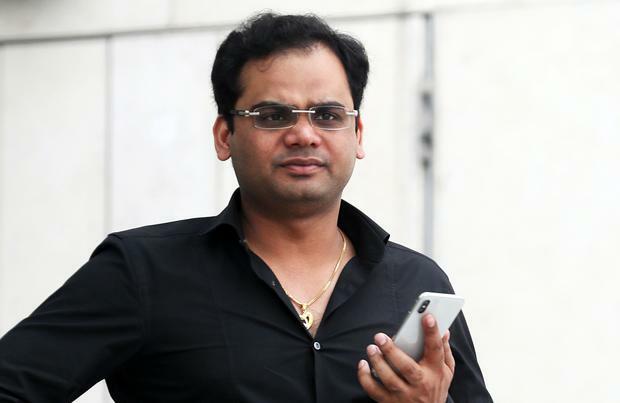 In June 2012 they signed marriage registration forms at the civil registrations offices in Galway in which they claimed they were living together as a couple at Pandey’s address in Limerick. To avoid suspicion they had also gave false and misleading information by providing a letting document to give the impression that they had lived at that address. Beikmane left the State after her supposed husband was granted a visa in 2013 and did not return until earlier this week, the court heard. She had been permanently residing in the UK with her fiancee since then, Judge Owens was told. They had no prior criminal convictions and did not address the court. Pleading for leniency Pandey’s solicitor Michael French asked the court to note that his client had come here to study and completed accounting and business studies courses. He ran five Subways and one Four Star Pizza branch and employed 30 people. The court heard that he was now applying for citizenship but his future in Ireland was at risk as a result of this prosecution. Solicitor Tracy Horan, for Beikmane, asked the court to note the woman was vulnerable and had come to Ireland genuinely looking for work. The facilitator who helped organise the marriage had been the beneficiary of the bulk of the money paid by Pandey. The prosecution accepted she had been vulnerable and she spoke little English. She has been working as a sandwich packer since she moved to England in 2013. The judge noted they had co-operated with the investigation and were remorseful. The court heard that Operation Vantage has led to a number of prosecutions but most of them have resulted in suspended sentences. Sentencing, Judge Owens said the prosecution could have potentially serious ramifications for Pandey and he had made a serious misjudgement in trying to regularise his position. She imposed a four-month sentence but suspended it on condition he does not re-offend in the next two years. The judge said Beikmane's situation was slightly different, however, she did participate in the crime. She received a two-month suspended sentence. They did not address the court during the hearing.